Home / android / featured / how-tos / Windows / Streaming Movies From PC To Android Over WiFi Without Even COPYING! Streaming Movies From PC To Android Over WiFi Without Even COPYING! Due to the limitations of Android's storage capacity, usually we would store all our HD videos, movies, etc in our Personal Computer and Laptops. But, when it comes to portability, your would prefer your smartphones over bulky Laptops and Computers. So here I am, back with a wonderful trick on "How To Watch Videos, Movies in Your Computer, Directly From Your Android Without Even COPYING!" to save all your time and effort needed to copy each and every video to your smartphone before watching it. Long working day, after reaching home, thinking of watching some movies, then decided to grab the smartphone. But...? Everything is in your PC. Ahhh(**long sigh**). Do you think, you gonna boot your laptop on and start copying the movies to it and, after all battling, then watch it from your smartphone? If it's me, then it's a "HELL NOOOOO!". So, just follow the below steps. Navigate to the folder, where the movie files resides. Or you could just select an entire drive. 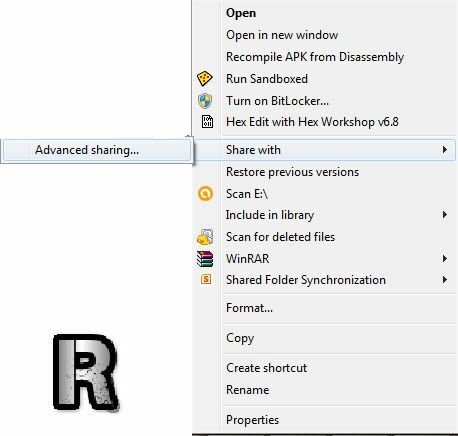 Right click on the folder or drive, then open the menu "Share with", then press "Advanced Sharing" as shown below. Click "Advanced sharing" in the window shown. 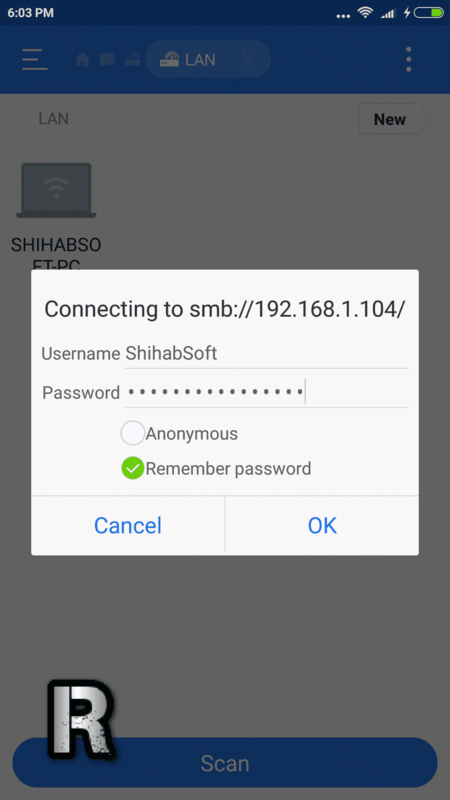 Click on "Share this folder" option and enter a friendly name as "Share name", which will be shown to your Android and any device over network. If you want, you could modify the permission level. For example, you could set the permission to "Read Only" or "Read Or Write", which enables you to copy files, rename files, delete files, etc. So ensure, you're the only one who has access to the PC with unique password. Because, If you're in a shared environment, with lot of people connecting to your PC, then it would be a security risk. So, I would suggest to leave this option, as it is. Now press "Apply" then "Ok". You need a third-party application to be installed. The most popular file manager app "ES File Explorer". Download it from the "Downloads" section below. 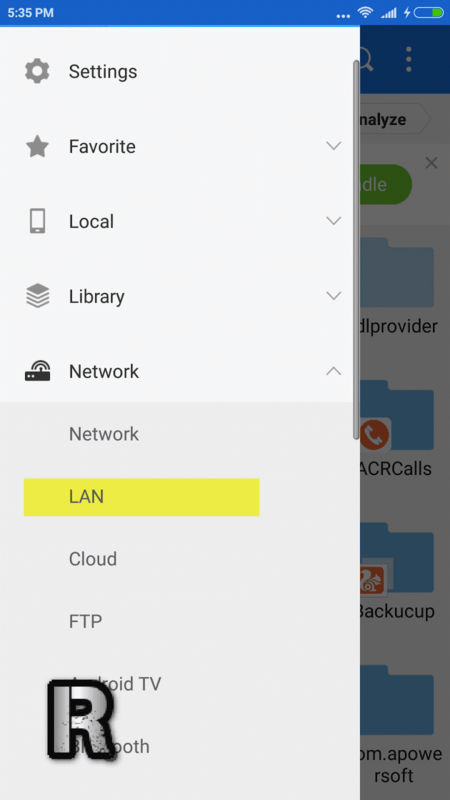 Now, make sure your PC and your Android smartphone is connected to the same network. 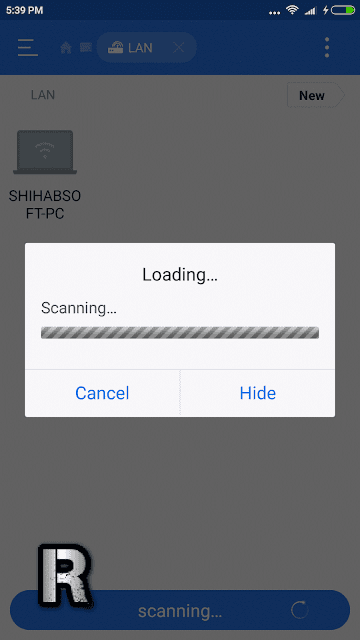 May be you could create a hotspot in Android and connect it to PC. Or please follow this link on "Turn your laptop into a wireless hotspot or access point with a double click." Open the app, then Slide from the left extreme part of the screen to right. You would see a menu like shown below. Then just tap on Network->LAN. Tap on "Scan", then wait a few seconds, until you see an entry with your PC's name as shown below. Just press "Cancel" to dismiss the "Scanning..." window. Click on that entry with your PC's name. Now type your Username of your PC's user account and in the password field, use the password of the user, that you've entered. Just tap on "Remember password", if you wanna eliminate the hassle of re-typing the password each and every time you connect. Hurray!! !, now you could see your folder that you've previously shared in your PC. 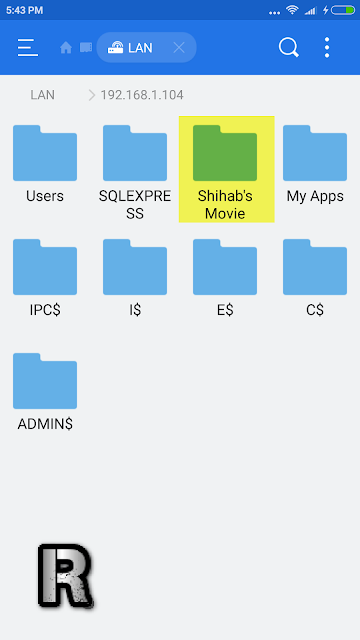 See the below picture(It shows the list of folders, which is shared from your PC). You can use the same steps above to manage your files in your PC, just as you're browing your phone storage. Download ES File Explorer File Manager from PlayStore. Help the developers by buying the Pro version. Download MX Player from PlayStore. Make sure your phone and PC is in the same network. Please read the steps one by one. Just Right-Click->Properties. There you could see a "Share" tab. The rest is same as mentioned in the post. It's pretty obvious, just make sure your phone and PC is in the same network. Please read the steps one by one.